VeryPDF PDF N-UP Maker, also known as PDF Stitch, is designed to help you make thinner and smaller PDF booklets from PDF. With this tool, you can easily make n-up PDF such as 2-up PDF, 4-up PDF and 16-up PDF from normal PDF. It also provides options to manage the output page layout and size. VeryPDF PDF N-UP Maker is compatible with both Windows and Mac operating systems. You can also use it to create PDF booklet via command line or through GUI. When you need to convert a PDF to a thinner PDF booklet, you can print multiple PDF pages per sheet via VeryPDF PDF N-UP Maker. For example, you can make 2-up PDF or 4-up PDF as illustrated in the following screenshots. The first screenshot illustrates a 2-up PDF sheet where the pages are arranged in horizontal order, while the second one shows a 2-up PDF sheet where the pages are arranged in vertical order. The third screenshot shows a 4-up PDF sheet where the pages are arranged in horizontal order. VeryPDF PDF N-UP Maker allows you to select any pages from the original PDF and then stitch those PDF pages easily. Four options are available for page range setting when make n-up PDF: all pages, odd pages, even pages and selected pages. The first screenshot below illustrates the effect after stitching only the odd pages. The third one shows the effect after stitching all the even pages and the last one shows the effect after stitching some pages selected by the writer. You can manage the output PDF layout by setting page margins. Four units are supported: mm, cm, inch and point. You can choose any of the four units for specifying page margins. The following display some effects after setting margins and making 4-up PDF. 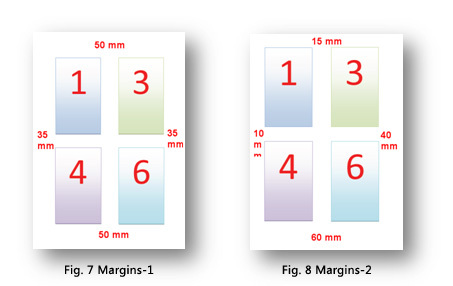 The first illustration below displays the effect after setting the top margin as 50 mm, the bottom margin as 50 mm, the left margin as 35 mm, and the right margin as 35 mm. The right screenshot shows the effect after setting the top margin as 15 mm, the bottom margin as 60 mm, the left margin as 10 mm, and the right margin as 40 mm. Make n-UP PDF files easily (e.g., 2-up PDF or 4-up PDF). Support gutter settings when make n-up PDF. Add lines between pages when make n-up PDF. Allow you to reset options. Allow you to open the output folder by one click. Allow you to preview the PDF before making n-up PDF.